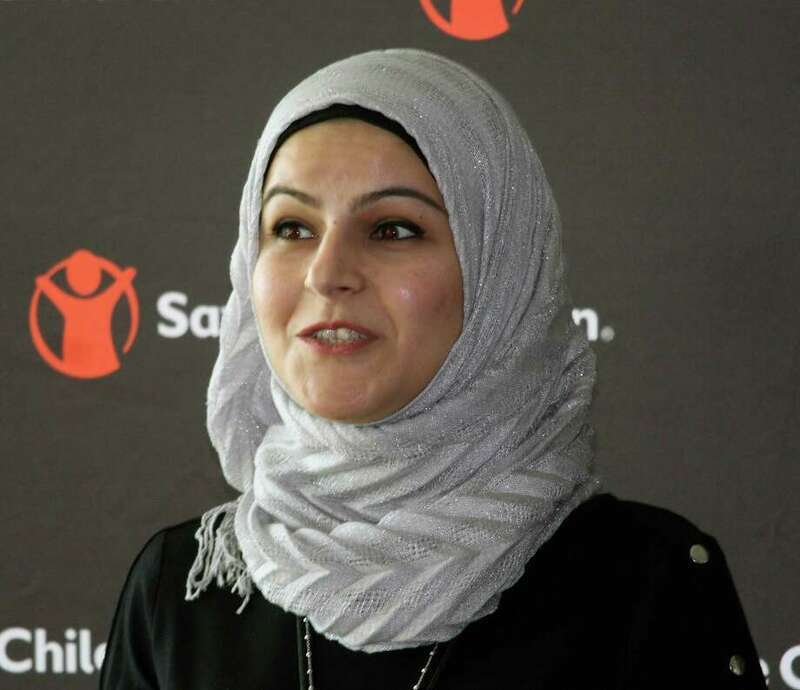 Syrian Refugee and Save the Children staff member Maha Karahamad, at Save the Children's "Solidarity with Syria" event, March 14, 2018, in Fairfield, Conn.
FAIRFIELD — It’s been seven years since the horrific outbreak of the Syrian civil war. An estimated 6 million Syrians are internally displaced. Five million more have left their homes and sought refuge outside the country. An estimated 400,000 Syrians have lost their lives. And still, the carnage continues. In the past month alone, more than 1,500 Syrians have been killed in the country’s eastern Ghouta region, just outside of the capital Damascus, with many thousands more trapped and without medical care, food and water, according to reports from the U.N. Refugee Agency and Doctors without Borders. From the window of Dima Akach’s high rise apartment outside Damascus, where she recently visited for more than two months, the wreckage was visible. “What I saw — I was weeping. Truly, it’s so scary. It’s devastating. It’s like a haunted area,” Akach told a crowd at Fairfield’s offices of Save the Children, which hosted a “Solidarity with Syria” event on Wednesday to mark the seventh year of fighting and raise community awareness. The sounds of bombs and gunshots kept her up at night for her first two weeks until, eventually, she learned to sleep through the explosions. According to Carolyn Miles, president and CEO of Save the Children, 5.3 million Syrian children, one-and-a-half times the entire population of Connecticut, are currently in need of help. Many families under siege lack food, fuel and medicine and are forced to pay 800 percent more than in government-controlled areas of Syria. Since the beginning of the year, 45 schools in eastern Ghouta have been attacked. Eleven have been fully destroyed. More than 4,100 families are currently sheltering underground. Schools and hospitals have been targets of bombs in recent weeks, Miles said. Through its partners, Save the Children has provided food baskets, education, health services, clean water, warm clothes and psychosocial support to 3.3 million people to date, including more than 2.1 million children. For more information on the war and to find out how you can help Syrians in need, visit savethechildren.org/syria. Akach was born in the United States but lived much of her life in Syria. She works as a translator for the Bridgeport-based nonprofit Connecticut Institute for Refugees and Immigrants (CIRI) which, among other things, helps to resettle refugees, including several members of the local Syrian community present at the event. Maha Karahamad, who fled Syrian in 2012 with her three children and now works for Save the Children in Greenwich, and Sleman and Mariam Mansour, who arrived from Damascus in early 2016, were also present to share their stories. Karahamad, 31, is a former private school teacher with a bachelor’s degree in English literature from Damascus University. Before the war, she lived a happy live in Syria with her children and parents nearby. She recalled the last time she saw her home in Syria. There was an incoming siege on the area, and Karahamad had 45 minutes to ready her kids and grab all of the possessions she could before hopping into the back of a truck and driving away as bullets flew around the vehicle. After moving multiple times within Syria, Karahamad decided to sacrifice her career and the life she knew in exchange for the safety of her children and fled with her family to Egypt in 2013. By the time Karahamad abandonded her home country, one million other Syrians had also fled to the north African country. She worked in Egypt for a while as a teacher and as a translator for Syrian refugees, all the while undergoing the extensive vetting process to resettle in the U.S. that would take her more than two years to complete. On Aug. 21, 2016, she and her children arrived in Fairfield County, thanks in part to sponsorships from a Greenwich church, and began to rebuild. “We’re safer from the crisis that drove us away from our country, but the reality hits hard. We’re back to the beginning and we’re starting to build a life all over again,” she said. The Mansours, who were resettled in Fairfield thanks to CIRI, spoke about their three children through the translation of Akach. “We lived in very harsh circumstances, we lived in fear — fear of the future of our children and what’s going to happen to them if we stay in our country,” Mariam Mansour said. In the U.S., the Mansours hope their children will be safe and free to follow their dreams.